More than 150 educationists attended a three-day seminar this week to examine our education system. Participants agreed on a range of problems frustrating education in our country ranging from inadequate infrastructure to ineffective teaching methodologies. The seminar was an excellent idea. And recommendations were good. But nothing is new. Education workshops and seminars have time and again identified the same problems and agreed on similar strategies to improve education. Why? Because no matter how many times we met, we hardly ever followed through on the important decisions. So the quality of education, let’s face it, remains poor. It wasn’t always so. In the early 1980s, some schools were widely regarded as education powerhouses. 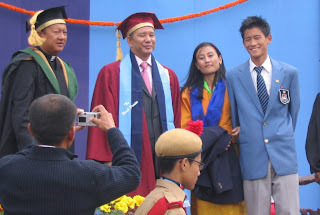 Punakha, Yangchuenphug and Khaling were the dominant schools at that time – they produced some of the finest students, many of who have gone on to do well in life. Today, I’m afraid, it is difficult to point out any school that performs consistently well. All our schools seem to be equally mediocre, at best. What’s going on? Why have even our top schools gone bad? The problems and their cures have been extensively catalogued through countless seminars and workshops, but we are yet to see a noticeable improvement in the education system. So while we wait for across the board improvements, consider Punakha, Khaling and Yangchenphug. Can we improve these three schools at least? Or for that matter any three schools? And make them into centres of education excellence? True, a lot of work would need to done. Even for just three schools. But think about what Punakha, Khaling and Yangchenphug had in common in the 80’s. All three had very good principals – Father Coffey in Punakha; Father Mackey in Khaling, and Mr Tyson in Yangchuenphug. Some say that those principals were good because they had a lot of power. And that’s the point. Good principals need authority and autonomy to do a good job. So can we identify three capable principals? Or a dozen, perhaps? And give them the challenge of improving their respective schools? They’ll need some amount of power and autonomy to get the job done. But they will succeed, even with minimal extra support. Difficult, you say? I agree. We’ve corrupted our system so much that it’s difficult to spot potential, ability and commitment. That’s why all our good principals go unnoticed. When we do, its difficult to acknowledge, cultivate and reward them. That’s why our good principals don’t feel appreciated. Most importantly, we find it extrememly diffcicult to devolve real power and authority to schools. And that’s why our principals find it so hard to deliver. But that’s no reason for inaction. Our children’s future is at stake. Galek, my daughter, age 9, class 4, finished her final exams yesterday. Today, her last day at school, is significant. It’s significant for me because she’s completed yet another year at school – a reminder that she’s growing up; that time flies. It’s significant for Galek too – today marks the completion of her first academic year since the introduction of democracy in Bhutan; the completion of one of the five academic years that we’ve given the DPT government to improve our education system. So I’ve been thinking: what has the DPT government done so far to improve the quality of education? And how have their policies made education more meaningful for our students? I’ll have to think, and think hard, about this for a while. Meanwhile, Galek will get her results today. Lyonpo Thakur, you’ve completed your first academic year as education minister. How would your report card look?